Most of us were stuck with pretty muted hair colors, like shades of brown, red, black or blonde. But what if you could have a bright hair color? What if you could have a head full of vibrant, shimmering purple hair? It might sound like nothing more than a pipe dream, but it's totally within the realm of possibility as long as you have a little bit of imagination and this Purple Wacky Wig. This adult wig has a whole bunch of synthetic fibers dyed with a vivid purple color that will have you feeling a little bit like some kind of wild cartoon character. 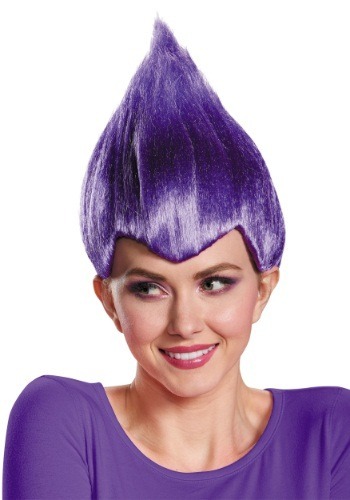 And the pointed hairstyle is reminiscent of a troll for all of your retro obsessed pop culture junkies out there! Once you have it on, your life might just turn into the kind of animated adventure you've always dreamed of...or it might just give you really cool purple hair. Either way, it's a pretty win-win situation for you.